WordPress by default creates a single page for each attachment that you have on your site. This includes images, audio/video files, pdfs, etc. This functionality is great for photographers, but not so much for the rest of us. Often we get complaints from beginners who accidentally linked their images to the attachment pages, and they don’t like the way it looks. That’s a big issue because a lot of themes don’t have special templates for the image attachment pages. Sometimes an image on your website can become popular and people might start landing on the attachment page directly from Google. Ideally you would want them to land on your post and see the image in the context you have used it. 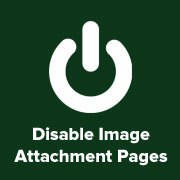 In this article, we will show you how to disable image attachment pages in WordPress. If you are already using WordPress SEO by Yoast plugin, then go to your SEO » Permalinks options page. 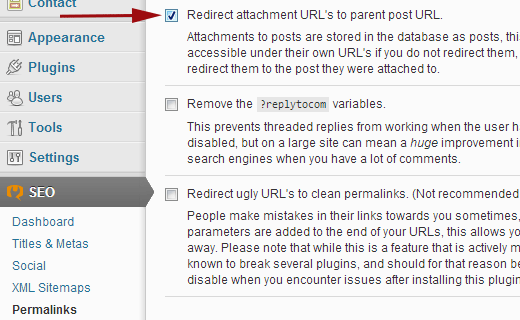 All you have to do is check the box next to “Redirect attachment URL’s to parent post URL”. This will redirect users arriving at attachment pages to the parent post. For those who are not using the WordPress SEO by Yoast plugin, you can still disable image attachment pages and redirect users to parent post using another plugin called Attachment Pages Redirect. All you have to do is install and activate the plugin. Upon activation the plugin starts redirecting users landing on attachment pages to parent post. If no parent post is found, then the users are redirected to homepage. This plugin works out of the box and has no settings page. Simple and easy. Save image.php file and upload it into your theme directory. Now when a users reaches the image attachment page, then they will be redirected to the parent post. Lastly, just want to emphasize that there is nothing wrong with using good plugins. See our article on how many plugins should you install on your site. We recommend that everyone use WordPress SEO by Yoast plugin, so doing this is as simple clicking on one checkbox. On our site, we haven’t disabled image attachments entirely because there are some instances where we want to send folks to a specific chart or image that we have on the site. Instead what we have done is that we excluded it from our sitemap. Furthermore, we have added a meta robots text noindex, nofollow to all of our attachment single pages using Yoast’s SEO plugin. You can do this too by going to Titles & Metas tab and going under Post Types. Simply check the noindex, nofollow tag for ONLY the attachment post type. We hope that this article helped you disable image attachment pages in WordPress and redirect users to parent posts. If you have any questions or feedback, then please let us know by leaving a comment below. should i disable the attachment media pages? if i do, will it affect seo? That would depend on your personal preference and if the main content of your site is images rather than posts and pages. Thank you! For some reason I have never experienced this issue using yoast until today! One of my sites kept redirecting to the image instead of my attachment page. Wasted an hour trying to figure out if it was a function issue I had created. Turns out it was the Yoast plugin. Easy fix thank yoU! Yoast has now changed all the settings, they keep doing this and honestly they’re driving people mad. This “Redirect attachment URL to parent post” was very handy and understandable, but now it doesn’t exist. When you upload media to WordPress, it doesn’t just save the media, it creates an attachment URL for it. These attachment pages are quite empty: they contain the media item and maybe a title if you entered one. Because of that, if you never use these attachment URLs, it’s better to disable them, and redirect them to the media item itself. What this seems to provoke is that now Google is showing image attachment URLs in the SERPs results. But there is no option, as before, to redirect the attachment URL to the parent post. What do we do then? Am I not understanding correctly the use of the new Media tab? What should I do so that Google doesn’t show those attachments as results in the SERPs that are not image search? Am I not understanding correctly the use of the new Media tab? What should I do so that Google doesn’t show those attachments as results in the SERPs that are not image search? What is it that I’m getting wrong? This post needs an update because Yoast has made a lot of changes to its features on new update. I agree. Not only did Yoast update, but they also removed the very option you are recommending in this post (unfortunately). And now all that’s left is to redirect to the actual attachment. The link is out of date now as the permalinks can be found under Advanced on the latest version. Thanks anyway as I have just updated it. So if we aren’t linking to these attachment pages, is there really any reason to redirect these so google doesn’t index them? The reason I ask is for videos directly uploaded, we have the transcript in the description field so google indexes that. If we redirect would it still index that transcript or should I leave as is? i was using all in one seo plugin and i found “Redirect Attachments to Post Parent:” in my seo General settings, and i mark it. So, is that same and worked? nofollow no index or disable ? Thank you SO much! This simple thing helped me a lot. Question: How can I keep WP from creating an attachment in the database? What I mean is that I have roughly 40k actual posts, and over 100k rows in the wp_posts table. After running a query, it seems that there is ~100k posts with post_type “attachment.” Are all of these rows necessary? Thanks exactly what I was looking for. I use yoastSEO so it was a single click. But how do you actually disable attachment pages? This post doesn’t disable them but puts a redirect in place. We have issues where the redirects is conflicting with actual page names. We dont want any attachment pages and therefore no need for redirects. I would like to keep the attachment pages but within the attachment pages that display the image in a bigger size to disable links to prev next and full size image as this is where they can copy images or see images that I dont want non registered users to see etc. How can we do that? Oh wait, I just realized something… if I no index the media files, does that mean all my media is not indexed or just the attachment pages? Hello i also disabled attachments pages in sitemap. will this technique prevents google to index images? If the images appear in posts as well, then no it will not stop Google from indexing images. Thanks for the quick help, it fixed things at once! May I add that after the modification on Yoast I had to go to Settings->Permalinks and save settings (no need to change anything). Your mileage may vary, this worked for me, thanks! It seems Yoast has changed things and this no longer works. Or something is stuck in cache. I’m having the same issue and I don’t think it’s the cache. I installed the plugin mentioned and that works fine. I had to go to Settings > Permalinks and click Save Changes (without making any changes) in order for it to work after the Yoast setting change. Please how to create image.php ? A nice informative article but oh my what a misleading title! The post title and the last sentence (after the comma) of the first paragraph are totally off!!! This is NOT disabling attachment pages/nor stopping WP from creating them (as the title implies) but redirecting links to it to somewhere else, and that is something real different! Disabling is stopping some from to be happen, and whatever code is shown in this article (even used by named plugins) it is not stopping WP from creating these attachment pages. This article is about how to redirect , which is okay ofcourse but not as implied by the post title and article as it. Such a shame because that would be a scoop! Henry has pointed out an important distinction. I am building a site that requires members to upload sensitive/private information via registration form. We absolutely can not have these files accessible to the public and need minimize any chance that these files will be indexed and publicly visible. Preventing the creation of attachment pages would seem the way to go, but I supposed redirects would work as well. We wouldn’t want to outright disable all attachment pages as we do want some uploaded files to be indexed, however, as WP Beginner Support pointed out, these files can still be indexed if they are contained within other posts. Think I will try enabling the attachment page redirects via Yoast SEO plugin as well as change the default directory where registration form uploads are stored (ie. will no longer be in default ‘/uploads’ directory) and disable indexing of that directory via robots.txt. What about older images which were previously indexed by Google? I have had the setting on in Yoast for “redirect attachments” for at least 6 months now, but my older images are still being found. Shall I just go and add all the tags? Glad I found this article. Was wondering why Google was showing all my image attachment pages in the search results. This helps! Thank you. into my image.php file and it worked like a charm. So will Google now de-index my attachment page url’s? Ok. Using the php code (no plugin) what happens if there are two pages/posts using the same image? Thank you! This was an excellent tip, just what I needed to help clean up errors found by Google. I tryed the code you suggest, it works with the images associated with posts os pages, but.. all the other images uploaded that are no assigned to any post, for that images your code does not work. Hello a user called Sam posted this issue – You write “Simply check the noindex, nofollow tag for ONLY the attachment post type.” but I do not see such an option. Are you referring to the “media” section? If I click no index under media will that no index my images or attachments? I would like to no index my attachments but I don’t want to lose traffic from Google images. Philip, no this should not affect your Google Image Search traffic as the option redirects users landing on attachment page to the parent post URL where your image is available for search engines to index. Is it ok to delete the attachment posts in phpMyAdmin? No, you are not supposed to delete data directly from your database. I tried adding the code you have given to my image.php file and it worked beautifully. thank you! You write “Simply check the noindex, nofollow tag for ONLY the attachment post type.” but I do not see such an option. Are you referring to the “media” section? If I click no index under media will that no index my images or attachments? I would like to no index my attachments but I don’t want to lose traffic from Google images. thanks so much for posting! very useful info and straight forward! appreciated!! Thanks for the heads up, I got a bit of a shock when I saw absolutely everything had been indexed, including elements of the template such as image backgrounds and so on. I’m using Yoast so it is an easy fix – I wonder though if it is worth still having pdf attachment pages indexed – I’ll look into it. It takes users directly to the PDF, if that’t what you want then yes sure. Is this possible to stop attachment pages to be indexed??? I do not want to redirect them to the home page. I just want to stop indexing them. Will this also fix the issue with creating duplicated content where the image holds the same title as the associated post? Heads up about the plugin… if you use the gallery option to present images in a post, the plugin blocks the function and clicking on an image brings the user back the thumbs index of the images. Thank you for this article. It has come just at the right time as I was trying to work this one out. Turns out it is a simple solution. Thanks! This is a very useful tutorial. Thanks for the tutorial. I became victim of Google Panda just because of indexing of alot of attachment pages from my photo blog. Is there any way to no index only attachment pages (not images) from Google? Because i have a photo blog and i don’t want to redirect my photos to main posts.